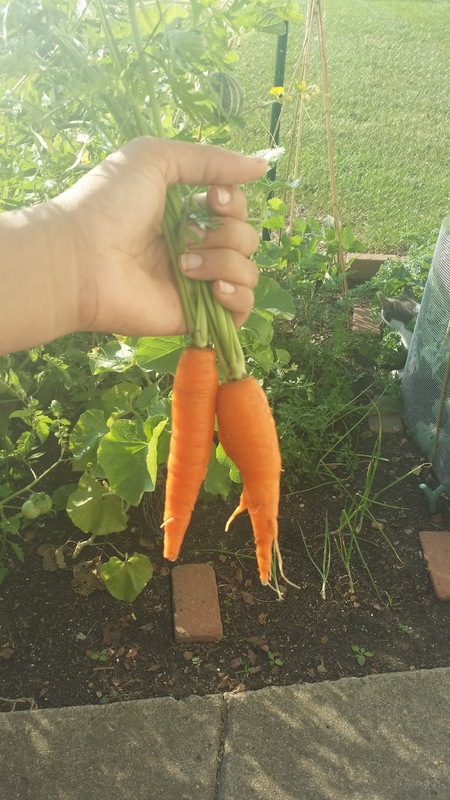 I harvested a few carrots today... I've never been so excited about carrots in my life. It was seriously a huge event this morning. Even the cat came to watch me dig them up. lol. My first experience with a garden was in my Granny's front yard. I have memories of this magical little space under a canopy of low trees. There were pathways between raised beds full of flowers. I must have been about 3 or 4 years old. My memories of this garden remind me of things I've seen in a magazine. It was absolutely magnificent. I finally found some eggs. It was only 3 but im pretty sure there is more. I put my bin outside in the shade this morning cause im having a nit fly problem, but finding the eggs made me stop worrying about the flies. So I want to start and with a flow through bin. Does anybody have a link on the website to educate me on how to harvest the casings and what the spacing on the grate should be? There are lots of great picture, but how do I harvest? I would like to know if stems from cut lavender serve well as bedding material (instead of things like straw, and perhaps mixed in with newspaper). The stems are very thin and stiff. I have a lot of the stuff. I believe redwood branchlets are NOT good due to the chemicals and wonder if the same is true for fragrant plants lilke lavender. Anyone tried this or have an opinion?